5w-30, 0w-30, 20w-50, 15w-40, 5w-20, 10w-40, 5w-40 diesel or 4 stroke engines. The industry benchmark in lubrication technology. Designed for those who demand the absolute best in motor oil performance. The exclusive “extended drain” formulation delivers superior engine protection and maximum fuel economy and exceeds the requirements of modern, high performance and older engines. What is a MOTOR OIL? opens a new window. "API" MOTOR OIL TEST COMPRARISON opens a new window. AMSOIL Introduces Signature Series Synthetic 0W-30 Motor Oil opens a new window. AMSOIL INC. of Superior , Wisc. has introduced a premier motor oil with a new, personal image. Supplemented with a proprietary ashless antiwear system for improved heat and viscosity control and boasting a 10 percent increase in TBN (13.2), new Signature Series sets the standard for protection and performance. Personally endorsed by AMSOIL founder and president Al Amatuzio, each bottle bears his signature and describes how he developed the first API qualified synthetic motor oil, thereby launching the synthetic motor oil industry. Engineered with the world's finest synthetic base oils and high performance additives, the exclusive extended drain formulation delivers superior engine protection and maximum fuel economy. AMSOIL Signature Series is a premium grade synthetic motor oil that exceeds the requirements of modern, high-performance engines and older engines, replacing other 0W-30, 0w-20, 5W-30 and 10W-30 motor oils. AMSOIL Signature Series Synthetic Motor Oil lasts much longer in service than conventional oils. The lightweight molecular structure of AMSOIL Signature Series Synthetic Motor Oil reduces energy loss from the "drag" common to high viscosity oils. AMSOIL Signature Series Synthetic Motor Oil contains specialized anti-wear technology so that engines last longer. AMSOIL Signature Series Synthetic Motor Oil is thermally stable with a strong resistance to high temperature volatility (burn-off). Unlike conventional oils, AMSOIL Signature Series contains no wax. Its exceptional -60°F cold flow properties ease starting and reduce bearing wear. AMSOIL Motor Oil 100% Synthetic 0W-20 delivers extraordinary lubrication for automotive gasoline engines. AMSOIL combined the industry premier synthetic technology and additives into a light viscosity formulation that withstands high temperatures and delivers outstanding fuel economy and cold temperature performance. 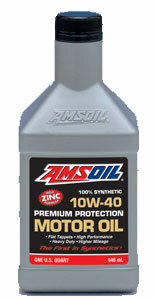 AMSOIL Motor Oil 100% 5W-30 is designed to provide maximum benefits in gasoline-fueled engines. Exceeds the most demanding world-wide performance standards and meet warranty requirements for all domestic and imported passenger car engines, both turbo-charged and non-turbo-charged. Up to 25,000-mile or 1-year drain intervals. 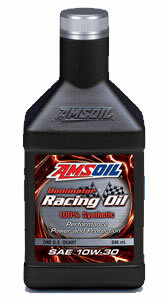 AMSOIL 100% Synthetic 10W-30 Motor Oil is designed to provide maximum benefits in gasoline-fueled engines. AMSOIL 10W-30 resists high temperature degradation and flows freely in cold conditions for superior protection against engine wear. AMSOIL 10W-30 also provides maximum power and improved fuel efficiency. Up to 25,000-mile or 1-year drain intervals. AMSOIL High Performance synthetic motor oils provide plenty of TBN and dispersant protection to control acid and soot in diesel engines, They also provide high levels of key anti-wear chemistries for ultimate protection of high-stress automobile engines. AMSOIL High Performance Synthetic 10W-40 Motor Oil is designed to provide maximum benefits in gasoline and diesel engines. AMSOIL High Performance Synthetic 20W-50 Motor Oil is designed to provide maximum benefits in gasoline and diesel engines. 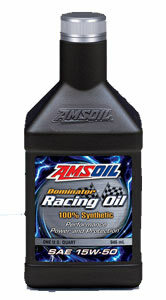 AMSOIL SAE 60 Synthetic Super Heavy Weight Racing Oil (AHR ) is designed for high horsepower racing engines, typically supercharged and alcohol-burning or nitro-fueled, and requiring a high viscosity oil to resist the thinning effects of fuel dilution. AMSOIL XL Extended Life Synthetic Motor Oils SAE 5W 20 5W-30 10W-30 10W 40 provide superior performance for up to 10,000-miles/six months, or longer when recommended in owner’s manuals or indicated by electronic oil life monitoring systems. Click here to go to XL page. Built with heavy-duty dispersant/detergent additives, its 12 TBN chemistry neutralizes acids and controls soot thickening from EGR and blow-by to protect against corrosion, cylinder bore polishing (wear) and varnish/sludge deposits. Fuel efficient formula for both gasoline and diesel fleets. Deliver up to 82 percent greater wear protection than other popular diesel oils. Series 3000 resists oil breakdown from heat, blow-by chemicals and oxygen up to ten times longer than conventional oils. 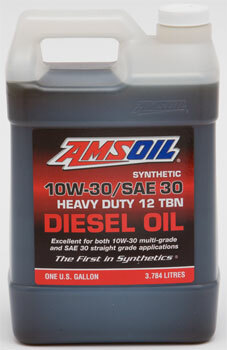 AMSOIL Semi-Synthetic 15W-40 Diesel Oil is a modern blend of high performance synthetic base stocks, natural base stocks, and advanced additives. It provides outstanding performance and protection over extended drain intervals in light and heavy-duty diesel engines. Where these viscosity grades are specified, AMSOIL Synthetic 10W-30/SAE 30 Diesel Oil (ACD) provides outstanding performance as a straight-grade SAE 30 for older two- and four-stroke diesels and as a multi-grade SAE 10W-30 in modern four-stroke diesels as well as gasoline engines. AMSOIL ACD is ideal for use in a wide variety of light and heavy-duty applications, including agriculture, off-road construction, trucking, mining, industrial (pumps and generators) and personal automotive or commercial transportation.